Bob appreciates seeing real estate deals through from start to finish. He enjoys partnering with clients to resolve issues that could block or delay projects. Real estate developers tap into Bob’s experience and rely on him to handle acquisitions, development, construction, leasing and sales. He also counsels property owners, lenders and industrial clients on risk analysis, purchase, sales, leasing and remediation of environmentally impacted property. Bob has guided several healthcare real estate transactions, including development, purchase, sale and leasing of medical office buildings; the purchase, sale and financing of nursing homes and assisted living facilities; and acquisition and disposition of hospitals and ambulatory surgery centers. 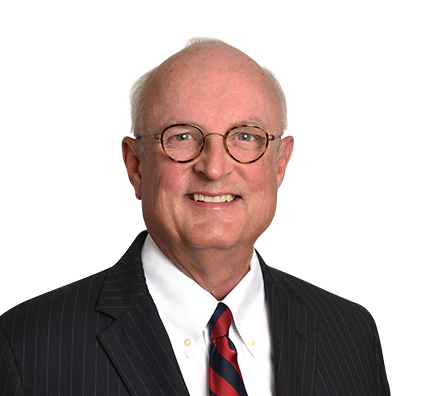 Before joining the firm, Bob was a Managing Partner at Brown McCarroll. Served as developer's counsel for 340-unit condominium project. Represented multistate developer on 350-unit luxury apartment development in Austin, Texas. Advised client on sale of hospital and construction of new build-to-suit hospital. Served as Texas real estate counsel in financing of client's acquisition of 41 assisted living facilities in Texas. Bob believes in physical fitness, usually working out three times a week with his wife. When the couple doesn’t work out together, Bob enjoys a brisk walk before work. An avid reader, Bob prefers historical fiction and nonfiction focused on England and World War II. He also travels extensively and lists trips to South Africa and beach resorts in the Caribbean as his favorites. Next up on his list: Alaska.